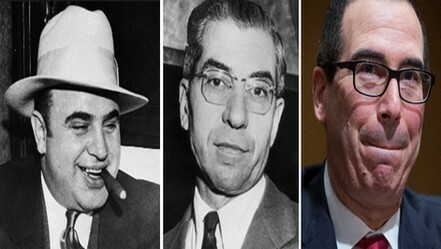 Steven (Steve) Mnuchin (right), New York banker who's spent a year being Secretary of the US Treasury, is worse at dissembling his racket than better-known racketeering peers, Alphonse (Al) Capone of the Chicago Outfit (left) or Charles (Lucky) Luciano of the New York Commission (centre). Mnuchin’s racket is billions of dollars bigger, but in legal principle and method, the fraud and extortion are much the same as the Outfit’s and the Commission’s. Mnuchin’s muscle is bigger too, though that requires warfare, which the Outfit and the Commission were established to do without. Last week Mnuchin issued a Treasury report to Congress on the impact of US sanctions on Russian sovereign debt, which isn’t a report at all. It’s a leak to a news wire, so sloppily arranged that one of the seven pages is a duplicate of the first, though the leaker didn’t notice he had slapped the same page on to the copier screen twice. The US Treasury didn’t realize, Bloomberg, the newswire, didn’t check. In the 228-year history of US Government reports to the US Congress, such a goof has never happened before. The fraud in Mnuchin’s report is to claim in public that he is attacking Russian financial operations and the future of the Russian economy when he is doing something quite different in private, protecting advantages for the leading US investment banks in which Mnuchin has had a life-long family interest. The extortion is what Mnuchin’s agents abroad are privately saying to persuade major foreign institutions competing with American ones not to buy or trade in Russian sovereign debt, when in public there is no legal authority for the US to do this. At the same time, Mnuchin is threatening to do to Russian sovereign debt what the US has never done to a country with which it was in a Congressionally-declared war – not Spain, Germany, Austria-Hungary, Italy, Japan. He also omits to identify what the consequences would be when China, the leading foreign holder of US sovereign debt, understands it will be next. China (including Hong Kong) currently holds $1.37 trillion in US sovereign debt, and the figure has been relatively stable since 2010. Russia holds one-tenth of that amount — just $105.7 billion; and it has been declining steadily over the same time. Mnuchin’s name, pronounced MIN-OO-CHIN — a contraction of the Hebrew name, Menachem — was required to report to Congress by the Countering America’s Adversaries Through Sanctions Act (CAATSA), enacted last August. Read the law in full here. For Mnuchin’s purported report on Section 241, the oligarch sanctions report and list, read this. Section 242 of CAATSA requires Mnuchin to “describ[e] in detail the potential effects of expanding sanctions…to include sovereign debt and the full range of derivative products”. Sovereign debt isn’t defined in the statute or by Mnuchin in his 6-page paper. He does say the Treasury has imposed sanctions on all debt issued by the “financial services sector of the Russian Federation economy”, forbidding dealing by “non-US persons” for maturities of longer than 14 days, by “any transaction processed to or through the United States.” That means any US-dollar denominated bond or security, or a “derivative product”, such as a currency or interest rate hedge linked to the bond or security. “Currently,” according to the Treasury paper, “these prohibitions do not apply to the sovereign debt of the Russian Federation.”. Although apparently public reports, the Treasury release doesn’t say so, and doesn’t issue official versions of the reports. Instead, on February 1, Mnuchin’s spokesman Tony Sayegh issued a “statement” claiming the press has been misreporting the Section 241 report on the oligarchs. Sayegh (right), a Republican campaign consultant and publicist for Fox media, didn’t mention the sovereign debt report. 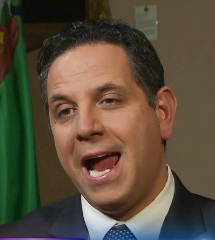 Sayegh fumbled his words, mistaking index for annex. He didn’t reveal whether the sovereign debt “report” has a secret annex attached. The leaked paper doesn’t say so either. Mnuchin claims in his first footnote: “This report is explanatory only, does not have the force of law, and is not a legally binding interpretation of the provisions of CAATSA.” Either the “report” complies with the statute or it doesn’t. Mnuchin tries to have it both ways. US corporate lawyers have been advising their clients for months that, in practice and in law, Mnuchin has been trying to sanction Russian sovereign debt, probably before last October when the Treasury issued an advisory paper implying as much. This provides a definition of “the term debt” to include “bonds, loans, extensions of credit, loan guarantees, letters of credit, drafts, bankers acceptances, discount notes or bills, or commercial paper.” Sovereign debt, meaning issues by the state through a ministry or the Central Bank of Russia, isn’t mentioned, so the hint that it is included in sanctioned Russian debt is allowed to appear, but not to appear at the same time. A paper by the Steptoe and Johnson law firm in December reported this vagueness was cutting in both directions. “U.S. law does not prohibit involvement in the issuance or trading of Russian sovereign debt. But there are legal risks that market participants are seemingly only beginning to come to terms with.” In short, although the prohibition against buying Russian treasury bonds wasn’t legal, the risk that it might be was having the same practical effect. Mnuchin’s leaked paper is the report the market has been expecting. But it isn’t what the CAATSA statute required. That leaves fear in place, and thus the risk of sanctions against Russian sovereigns, but without the legality. If Al or Lucky had tried what Steve is doing, they would have been accused of fraud and extortion. The court cases which put both men in prison were notorious fit-ups by US prosecutors. Left: Capone (centre) on trial in Chicago June 1931. Right: Luciano on trial in Plattsburgh, New York, August 1936. Mnuchin’s admissions are almost as damaging as his omissions. “The Russian economy rebounded in 2017”, the report says, because of “prudent Russian government monetary and fiscal policies…while managing a low level of public debt.” Only in future, if US sanctions are kept in place – hint, expanded to sovereign debt – can Russia’s economic recovery be restricted. The Treasury projection, cribbed from analysis by the International Monetary Fund, is for sub-2% annual growth, based on an oil price averaging $50.80 for the next five years. The Treasury also reveals that the foreign holdings of Russian sovereign debt, including American purchases of Russian finance ministry obligations, declined to 15% of the aggregate in 2014 and 2015. But in 2016, they started rising again, and now foreign holdings of Russian sovereigns are at an all-time high of almost 40%. The corresponding US Treasury data showing American holdings of Russian state and corporate debt issues currently amount to a total of $65.6 billion, of which Russian corporate issues comprise almost 80%. Russian sovereign debt in US hands amounts at the moment to just $12.5 billion. This was not the peak value for US holders of Russian debt. In October 2013 the total US holdings reached $73.1 billion; peak US holdings of Russian sovereign debt then amounted to $14.7 billion. The numbers have declined since then, but today they remain significantly above the $49.5 billion total first reported in 2011. This is how the Treasury report tabulates the figures. The presentation is tipped downwards to the right on the page, indicating the Treasury leaker was in such a hurry, the pages weren’t properly aligned in his copier. More importantly, the tables show the revival in major foreign holdings of Russian debt has not come from the US. US Treasury figures reveal that US buying of Russian sovereigns rose until 2013; they have been in steady but slow decline since then. Mnuchin may intend to accelerate the speed at which Americans divest from their existing Russian sovereign holdings, and are dissuaded from buying new ones. But unless he can twist the arms of all other foreign buyers, the effect on the Russian state’s finances has so far been, and will be, negligible. 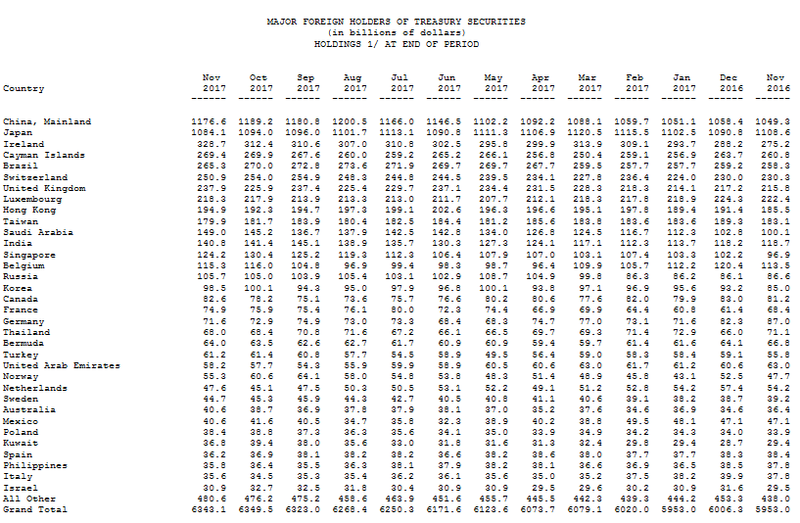 The US Treasury reports monthly on the country of origin of the major foreign holders (MFH) of US sovereigns. These are official reports from the government website, not leaks to a wire service; they are also correctly aligned on the page. This table shows that Russia held $105.7 billion worth of US treasuries as of November 2017. That places Russia 15th on the country list, with just 1.7% of the total foreign holdings. Going back in time, Russia wasn’t a big enough buyer to be separately identified on the MFH charts until January 2007; that’s when Alexei Kudrin was Minister of Finance. He initiated significant purchasing of US treasuries that year for an outlay of $8.5 billion; for more on Kudrin, one of the Kremlin officials omitted from the US Treasury’s list last week, read this. 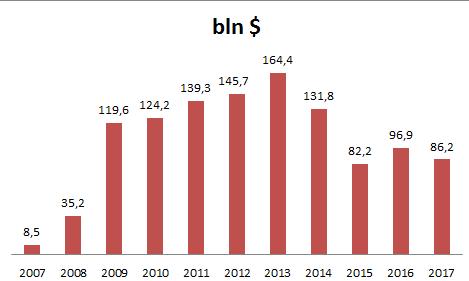 The aggregate rose sharply, hitting an all-time high at $176.3 billion in October 2010; Kudrin was still finance minister. In that month, Russian holdings of US sovereign debt came to the 8th largest on the country list, comprising 4% of the total of foreign-held US debt. This is how the Russian holdings changed over time. Mnuchin’s paper admits that Russian “need” for new sovereign debt issues is “limit[ed]” – a concession that threats of sanctions to stop US purchases of Russian sovereigns have so far had “limited” impact. It is also a concession that if Mnuchin is about to turn last year’s threats into fresh legal prohibitions, the impact on Russia is likely to be the same. The MFH table indicates why Mnuchin is confident that the Russian stock of treasuries is too small to make a difference to Washington if the Kremlin retaliated by selling out. But what if there is a domino effect on larger foreign-government holders, particularly China and Hong Kong, India, and on those financial havens where cash is hidden from taxation at origin – Ireland, Cayman, Switzerland, Luxembourg and Bermuda? Altogether, their holdings – some of them Russian — amounted to $2.6 trillion as of last November. That’s 42% of the MFH total. Anxiety was expressed during the Obama Administration that escalation of US economic warfare against China may trigger retaliation with a decision by Beijing to sell down the Chinese stock of US treasuries. A report by the Congressional Research Service (CRS) in mid-2013 minimized the risk, so long as the Chinese action isn’t a sudden one, followed by a domino effect on other foreign buyers of US debt. How much would these “spillover effects” cost the “large US asset managers”, compared with what they would cost the Russians, Mnuchin doesn’t hazard a guess. He admits the current efforts to jawbone financial sanctions without legal enactment is producing “over-compliance by global firms”. But by going legal, Mnuchin concludes he doesn’t know whose interests would suffer most, American or Russian. In London an international banker warns the Russians have the option to declare a default on their US treasuries.